With its glut of plant-based eateries and decidedly veg-focused population, Tel Aviv has been called the vegan capital of the world. But even with over 400 vegan joints in the city, Opa restaurant represents a vision as fresh as Chef Shirel Berger’s acclaimed fare. Located in the scruffy-but-hip Levinksy Market, Opa’s curt, modernist façade is a departure from the tumbledown grocery shops and wholesale stores that otherwise dominate. 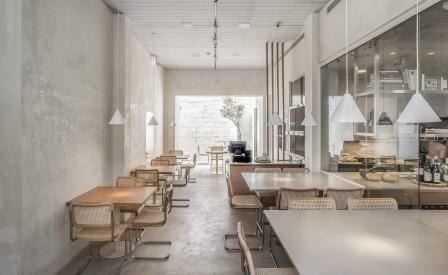 With its combination of glass and dry wall it’s ‘more art gallery than restaurant’, says Craft & Bloom’s Emma Shahar, who partnered with architect Vered Kadouri on the design. Inside, the style draws from Berger’s cuisine – clean, minimal and locally sourced. Neutral plaster walls and buffed concrete flooring play canvas to restrained furnishings, with ceramics by Telavivi makers Merav Waldman and Leehee of Out Wandering, while neat decorative lights were designed by Craft & Bloom and made in Jaffa. A discreet inner patio, painted in white, is fashioned from Hevron stone – hand cut just 25 minutes outside the city.